I am truly Quinoa’s number 1 fan nowadays! I love cooking it and enjoy it as my new found rice replacement. I thought it would be great to make it for the holidays. I experimented cooking it with some spices and see if it would work. I also added dried cranberries and raisins, pomegranate seeds and cilantro to the mix. I was truly happy with the result. The raisins and cranberries added sweetness to the quinoa and you taste just a little hint of the spices. The pomegranate seeds gave extra crunch and the lovely cilantro added some lemony-mint flavor too! It was truly wonderful! The flavors just worked together so well. You can serve this warm, room temp or cold – whichever you prefer. I think it’s great as a side dish for Roasted Turkey or Chicken. Needless to say – it’s colorful and festive enough for the holidays! So, without further ado – here’s our latest Quinoa creation. cold running water, rinse it for about a couple of minutes. Drain really well. (big enough to accomodate about 3 cups of liquid). Stir in the cranberries, raisins, the spices and salt. Mix everything. Pour in the 2 cups of water. Give it a gentle stir. cook. It will automatically turn to warm mode when it’s done. Turn the cooker off and let the quinoa sit for about 10-15 minutes. the quinoa gently with a fork to separate the seeds. You can transfer the quinoa to a bigger bowl to make mixing the rest of the ingredients easier. Mix in the cilantro and half the pomegranate seeds. You can serve it as is or if you wish, you can form the quinoa mix into a mound – see photo below. Sprinkle the rest of the pomegranate seeds (and perhaps some extra dried cranberries and raisins) around the mound. You can sprinkle a few more chopped cilantro on top to even the colors. Serve with your main dish. Yummilicious! Brilliant and beautiful–great invention by you! Thanks and I will try it tonight! Thanks Gurpriya! I hope you like it as much as I do! Hi Abby, I hate to eat pomegranate as I did not know how to remove the seeds from the fruit until last month from a Taiwan's cooking program. I would like to share with you in case you have difficult like me to remove them from the fruit. She taught us to cut off the top and bottom and then cut lines on the skin around the skin from top to bottom so that you can open up the fruit. Put it into a bowl of drinking water and remove the seeds in the water and then drain them. By this way we will not break the seeds. Blend pomegranate as it is a very healthy drink !! Thanks for so many yummy recipe to share with us. Hello, where did you buy your quinoa? I am not a fan of quinoa, but, this recipe is definitely going to change my mind. Those colors and flavor combination is absolutely divine. Is it wrong to refer to a recipe as adorable? Your presentation is just so cute, I almost (almost) wouldn't want to eat it! You really don't know how I love pomegranate seeds. 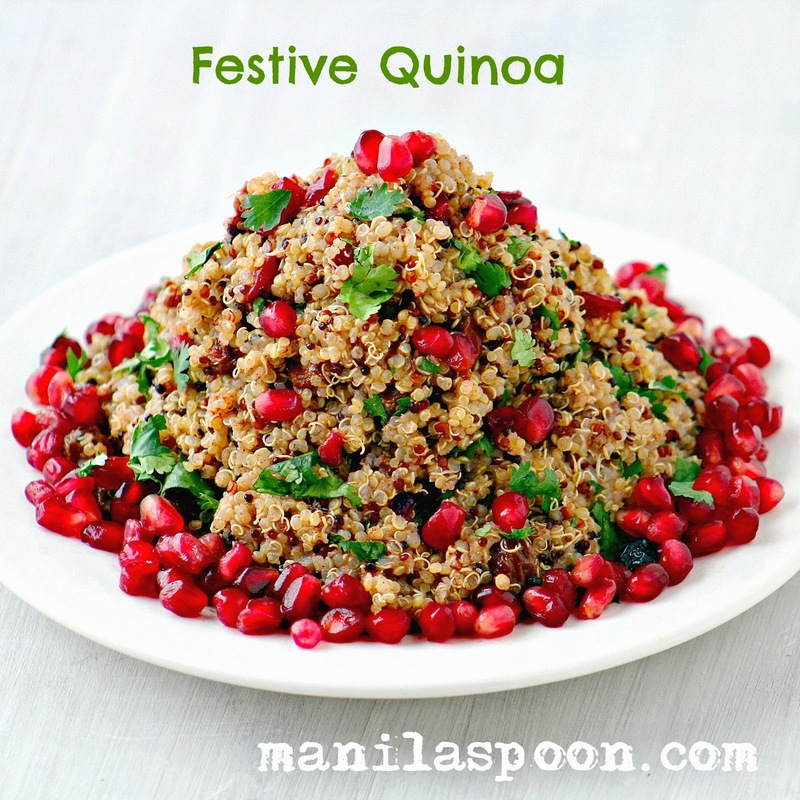 I used it quite often in salads, baking goods, smoothies and I absolutely love quinoa, too. Your dish looks scrumptious and so delicious, a feast for the eyes as well, pinned!